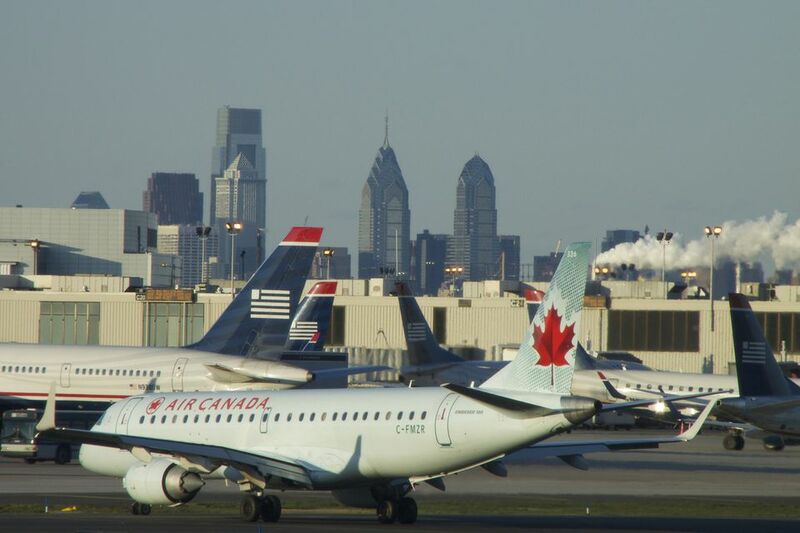 Philadelphia International Airport ranked as the 20th largest in North America, handling 30.7 million passengers in 2014, according to Airports Council International-North America. Officials say that the airport generates more than $14.4 billion in spending to the regional economy and accounts for more than 141,000 jobs in the region. The airport serves as a hub for American Airlines. Other carriers with a large presence at the airport include Delta Air Lines, Southwest Airlines, and United Airlines. It has seven terminals with 126 gates along with four runways. It serves 91 domestic and 39 international destinations. Philadelphia International Airport has spent more than $2 billion in capital improvements since 2000, including a $45 million expansion of Terminal E; a $12.5 million renovation of Terminal A-East; $550 million to build Terminal A-West. Philadelphia International Airport is conveniently accessible by I-95, I-76 and Route 291. SEPTA Airport Regional Rail Line platforms can be accessed from the pedestrian walkways between the terminals and the bag claims at Terminals A-East, B, C, D and E (Terminal F passengers board/exit at Terminal E). Trains to Center City Philadelphia depart every 30 minutes between 5:09 AM and 12:09 AM and stop at Terminals E, C/D, B, and A-East before continuing to Eastwick, University City, 30th Street Station, Suburban Station and Jefferson (Market East). SEPTA-accessible bus service is provided by the Routes 37 (to/from South Philadelphia), 108 (to/from 69th Street Transportation Center) and 115 (to/from Suburban Square in Ardmore). Bus fare costs $2.25; transfers are $1.00 (exact fare, cash only). SEPTA buses board at Zone 1 outside the baggage claim at Terminals A-East, B, C, D and E (Terminal F passengers can access buses at Terminal E). Taxi services can be accessed at Zone 5 on the Commercial Transportation Roadway. Taxi rates are based per trip, not per person. Most taxis can accommodate up to three passengers. In some cases certain vehicle types can accommodate four passengers. Child safety restraint rules apply to taxis. Fares: $10.00 minimum fare from the Airport to any destination. There's a $28.50 flat rate from the Airport to Central Philadelphia area. Sedan and Limousine services can be accessed at Zone 6 and Shared ride van services can be accessed at Zone 7 on the Commercial Transportation Roadway. Although the airport does not have a hotel on site, there are more than 300 options in the area. Below are 10 nearby options. Among the unusual services offered at Philadelphia International Airport include Art at the Airport. The art program features a series of rotation exhibits including posters of movies made in Philadelphia, Young Artists - Making a Real Difference and 75 Years of Commercial Air Service @ PHL Since 1940. A partnership with Autism Inclusion Resources LLC, the Transportation Security Administration (TSA), The Gray Center, and participating airlines to help families with autistic children become familiar and comfortable with traveling through Philadelphia International Airport.